I found this article to be very informative. I agree with Sara that it's an interesting comparison of Christianity and Judaism with Plato and Ancient Egypt. I did not realize how much Paul was influenced by greek philosophy. I believe Moses, for example and everyone in the old testament for that matter, were intent on following every letter of the law....while with Christ....grace comes into play and we know it's given freely. He gives it to us as a way of interacting with us. I found this post very interesting. While I read the Allegory of The Cave in high school I never linked it to the binary distinction of the moon verses the sun. The other topic I found really interesting was how Abraham, Moses, Noah and David pointed to Christ. I guess I always kind of knew it but I never thought about it in this way before. I think that it is interesting to link all of their lives to leading up to Christ, and also how Abraham obeying God and preparing to sacrifice Issac almost parallels God allowing the sacrifice of his son Jesus Christ. Grace to me is receiving something that is undeserved. It is true, where in this article it says that St. Paul believed that grace is better than law, and I totally agree with that. I also agree with あじ's first post about how the Law refers to Moses and Grace is Christ. The last paragraph of the article is what got to me. I never realized that Christ was foreshadowed throughout the Bible. Especially with the story of Isaac. He was on the alter laying before his father, when an angle came to stop Abraham from killing Isaac. I never correlated this story to the story of Jesus and His sacrifice. Grace is a gift from God considered to enlighten and strengthen one's soul in order make it easier to do good and reject evil. The Grace of God is the way to heaven. The way to enter heaven is to abide by God's laws. Exodus 34:11 "Obey what I command you today." God gives us both laws and the Grace to keep those laws. Christianity believes both are required by God to return to his heaven. God's laws are expected to be followed, and through his Grace we are forgiven when we fail to do so. They are so dependent on each other, one can not be without the other. The original covenant between God and Abraham is built on them both. Plato's theory on the Forms is very interesting to me. It seems so natural yet so easily questioned. Science can be used to explain a lot, but where did it begin. Erikson believed a child is born into a stage of Trust vs. Mistrust. An infant trusts their caretakers, and is completely dependent upon them. Why? Have they seen the real forms before birth, remember them, and just know things naturally? Learning is a life-long thing, but there are things we don't need to learn, like how to love or determine what can be trusted. Forms can be taking to so many different levels. In regards to Christianity, are the Forms present in heaven and therefore given to us by God in the form of our soul? There is so much more than can be seen and felt. Monica asked me to post this for her. Grace is God to me. There is no other way to get any better than to think of God as the most Graceful thing. Grace is not something you learn, it is something that you have. Grace is knowing that God will be there for you. To me Grace is what you make of it yourself how you see it and I see it as God he is Grace to me. Nothing gets any better then that." "Psalm 118 V.8 (The middle of the Bible) states, It is better to trust in the Lord than to put confidence in man. Psalm 84 V.11, For the Lord God is a SUN and shield; the Lord will give grace and glory. Let us not forget Job. He was faced with many tragedies, yet his faith in God never faltered. I will however disagree with Sweeney. I believe that if you are first at peace with God, then you will be at peace with yourself. I see the "Cave," pertaining to your faith in Christ. Believing in Jesus Christ brings you into the light and out of the darkness." Karen asked me to post this comment: "When I think of grace I think of favor from God. Whether we are deserving or not, it is God that allows us to prosper from his blessings that he has for each of us." "I have always found the Egyptian-Sudanese cultures quite astounding and the conclusions they formed. For instance, the determination that the Moon ONLY reflects light. Their observations of sidereal astronomy had to be very intense. But of course, their true focus was on the source of light and life, the Sun; symbol of Creator. The ancient Greeks were astounded by their ideas as well. Plato's famous Allegory of the Cave was the interpretation of the ancient Greeks' observations of shadows in a cave which were believed to be actual objects; upon given further direction, they decided differently. Egyptian cosmology influenced Plato's reasoning. Further progression of expression of the primitive peoples was the formation of the Greek alphabet which initially came from Egyptian hieroglyphics. And how did the early civilizations calculate the precession of the equinoxes to determine that it would take between 25,000-28,000 years to cycle [? ], thus being called "Earth's Great Year." It was stated they "studied the heavens carefully." I'm astounded as to how they gathered their precise information. Upon the planets and stars returning to their initial position, led Plato to conclude that this completed rotation became the "perfect year." Ancient cultures created over 200 myths in reference to a Great Year, according to knowledgeable sources. Saint Paul when writing his letters to the early churches used the Greek word for conscience, proving his influence by the past teachings of the Stoic philosopher Athenodorus. However, this word does not appear in the Hebrews Scriptures of the Old Testament; the word "heart" replaces conscience. I personally feel by using the word "heart instead of conscience in the scriptures promotes more conviction. 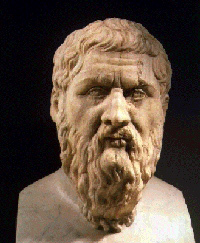 Plato's "Form" theory stresses realism more than its material reflection. Paul exhibited more of his Greek influence by referring to Adam as the imperfect man and Jesus Christ as perfect; the binary system continues in Platonism. In Galatians 4:21-31, St. Paul states that grace is better than law using the binary method of interpretation in the platonic approach. He used the comparisons of "familial bond" in Sarah as always stronger opposed to a contractual relationship in Hagar. More distict examples were stressed in this article giving evidence to the Greek influence upon Plato. The final determination is...that Jesus Christ IS the true Form, not the one pointing to the Form; hence, the binary method of evaluation." "I feel that grace is defined in this passage as someone who wants to act in the way of Christ. Sarah is represented as having a familial bond due to the blood relation with Abraham but, she represents grace because the way she believes and acts within Gods likeness. I believe that anyone who believes in God and acts in Gods ways shall have and give grace." "I can agree with Plato's belief, I too believe that there is some sort of 6th sense, and that we can re-know objects, because we have encountered them before in some fashion. It seems to me that it's like being reincarnated, that you have already experienced these things before, maybe in another life form, and that is why they are easily retrieved from the soul. This could explain paranormal activity, because these energy's and souls are just floating around in this external space. Plato perceives life and our souls not as just a "material reflection", and those that believe in God share those same beliefs because they are acknowledging that there is more than just meets the eye, nose, fingertips, etc…." Plato believed that there were a finite number of souls and that when a person died their soul returned to the place of eternal Forms. That soul would eventually take residence in a newly born person. This isn't reincarnation as it is understood in Hinduism and Buddhism. I believe that grace and law are completely seperate today. But that doesn't mean that they should be. Seems todays society is more concerned with their own agenda's. The grace of God and related teachings such as " love thy neighbor," should maybe be used a little more our law making today. If people were a little more concerned about their neighbor than theirselves what might the human race be today? I love these articles with reference to the biblical scriptures, however, they are always tied in with other parts of the pasts, cultures and religions, very interesting. Also, I must mention that these blogs suit out reading assignments and flow nicely together. "The article states that Athenodorus said that, “Everyman's conscience is his god.” My interpretation of this statement is that we all have the “knowledge” or “truth” inside each of us to live a proper life in the eyes of God. While helping my wife raise her children I have felt that it is better for me to teach them to look inside themselves for the answer rather than trying to teach the answers for all life’s struggles and situations. I believe that the Grace of God is the love and mercy given by God when we ignore our inner guidance or conscience and make improper choices in the way we live or the actions we have taken. We are all old souls and should know the correct way to live our lives, but most make some wrong choices along the way, but by the grace of God we are forgiven for our shortcomings." "I understand grace as a gift from God. As Christians we are to obey gods laws and he will bestow his grace upon us and we will be permitted into heaven. Thank you, Sara, for asking about this part of the article, "Platonism regards the symbol or form as real than its material reflection." I also didn't understand this. I have never really bought into reincarnation, but after reading this about forms I had to think about it.I still don't think reincarnation is what I am thinking but Ashley C put words to my thoughts when she said, "Are the forms present in heaven and therefore given to us by god in the form of our soul?" I like this thought rather than thinking we are reincarnated." "There are laws that God expects or wishes for us to follow, but because he knows that it is impossible to succeed, we are under grace. God has shown us that it is not our works, good deeds, or following the laws that get us to Heaven, but only by grace through faith shall anyone enter the kingdom of Heaven. Before Christ, punishment may have been enforced a lot more than today. Christ died in place of us for the sins and laws we do not follow. So now we understand that it was the strictly enforced law that Jesus made to show us that we are sinners and he is the almighty God and even though we are not worthy of his grace, we get it anyway." Let me ask this? Was St. Paul presenting Law and Grace as binary opposites? If so, what meaning is found in their relationship? I found this post to be interesting and everyone's comments to be interesting as well. I believe as well as most comments that grace comes from God and without the grace of God we would not be able to survive. I also think that the law is something totally different from God's Grace. We abide by God and have our conscience telling us what is right from wrong as we do with the law but I agree with Ssexton that Grace is given to us freely and gives it to us as a way of interacting with us. I believe as Plato did with the eternal soul because even though you can see, smell, hear, or taste something you still know what it is from within. Law and Grace are presented by St. Paul as binary oppositions, but as we learned, meaning is found in the relationship of the oppositions. One is always greater, stronger, brighter, etc. than the other in its visible attributes. The Sun is brighter than the Moon and the Moon's light is a relfection of the Sun's light. Men are physically larger and generally stronger than women, but are born of women. Grace is superior to the Law, but makes no sense without the Law. For as St. Paul says, the Law was our "school teacher" until Grace should be revealed in the Incarnate Son. Kinship analysis of the Genesis 4 and 5 geneaological data reveals that Cain and his brother Seth married the daughters of a chief named Nok (called "Enoch" in the Bible). They are verifiably historical persons since we know where Nok ruled. In the ancient world, archetypes (Adam and Eve) spoke truth as much as historical events or persons. In fact, archetypes speak more adequately of univeral truth that the particular lives of individual persons who actually lived. "While I do believe that Adam and Eve were people and also that through God we reach salvation, the idea of Adam and Eve as archetypes is a interesting idea. Sin is in everyone no matter who you are it was in Adam and Eve as well. As humans we have sin no way around it. To me it is how you control your sin and what you do with it that counts." "I once again concur with Ashley C. and Brittany. I do not believe we are born with sin, as children, we learn from our parents, other family, peers and environment what sins are and then we make our own choices between right and wrong. I like the word hurdle that Ashley used for sin. In my own opinion god and the devil are good vs evil. Thank God, for always being there to rescue us when we do choose the wrong side." God doesn't always rescue. Consider the case of the Assyrian city Ninevah. God sent the prophet Jonah to warn the city and it repented. However, it returned to doing evil - robbing, killing the poor and undefended, and torturing people it conquered. Finally, God sent the prophet Nahum to pronounce destruction on the city. Ninevah was so thoroughy destroyed that for centuries it was believed never to have existed. Archeaologists have excavated the site of ancient Ninevah and now know that it had a wall around it that ran for 7 miles and was wide enough for 2 chariots to run astride along the top.